A Compassionate 2012 | Julie O'Neill Photography. 2012 is here and along with it came many resolu­tions. The resolu­tions this year seem to have some common themes. It appears that 2011 has encour­aged us to act. 2011 was a busy year with people making waves and making changes all over the world. From the protests in the middle east to the occupy movement, to a list of new animal protec­tion legis­la­ture in the west, it was an action packed year. Is it possi­ble that the event­ful year behind us has inspired us to be better, to love more, hate less, and to stand up for our rights as well as the rights of others? The resolu­tions that I have overheard others (and myself) making for the coming year are less about making money and acquir­ing more stuff and are more about being better people. Being a better husband, volun­teer­ing, compost­ing, consum­ing less, being less judge­men­tal and being kinder are all examples of resolu­tions that are popular for this year. Just in the nick of time! If the Mayans are correct, this year’s resolu­tions will be our last, so we had better make them good! I can’t think of a more fitting time to start caring for one another and our planet. The Mayan prophe­cies predict that something big is going to happen and if not the end of the world then a trans­for­ma­tion into a new age. While the world coming to an end can be a little dark and gloomy, I think that the sound of a trans­for­ma­tion into a new age is thrilling. Its time to jump on board. Let’s stop allow­ing our tradi­tions and old habits from holding us back and let’s create a new, more compas­sion­ate world in 2012. We must work to heal each other, the planet, and animals. It is time to make things right in the most caring and conscious way that we can. We might as well start with breakfast! When I was younger I regularly went out for Sunday break­fast with friends. Especially, after a night out it was so much fun to review the crazi­ness that had taken place the night before. These famous break­fasts were always full of hearty laughs, cups of coffee and eggs. I will forever miss these moments but never again the eggs. 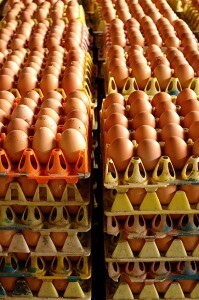 Of the foods that I don’t eat these days I find eggs the most offen­sive. There once was a time that I loved eggs. I think mostly because I associ­ated them with these good ol’ days. This trans­for­ma­tion didn’t happen overnight. 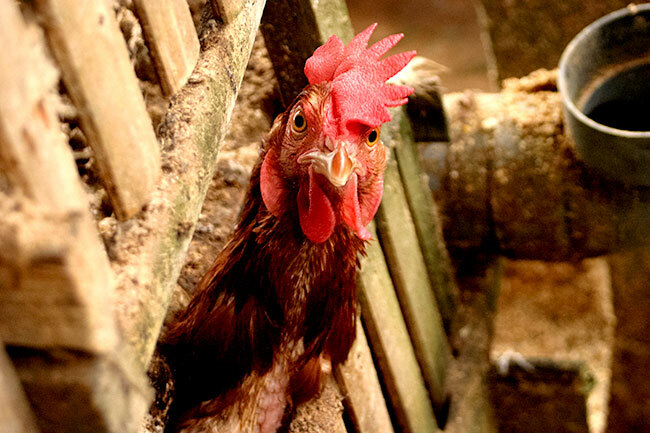 As I began to learn of the horri­ble lives that chick­ens endure to produce my eggs I found myself craving them less and less. Eventu­ally, my tastes and habits changed and adjusted, like they all can after time. 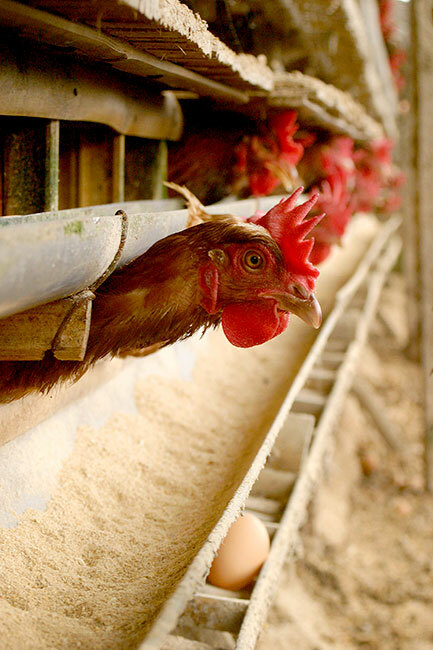 Of all of the animals that suffer for our food, egg-laying hens may suffer the most. Their lives are long and drawn out. 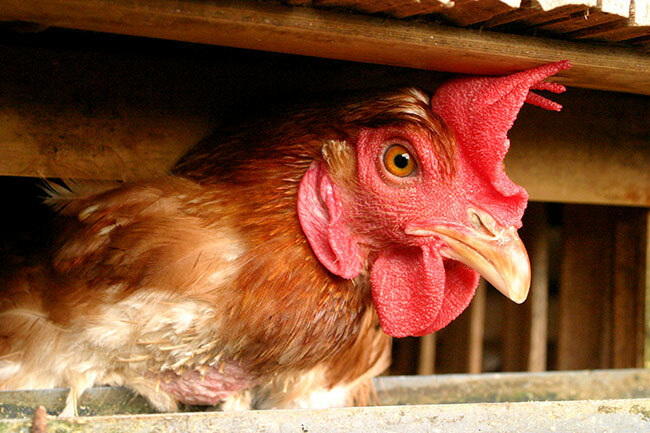 They are kept impris­oned until their bodies and minds are so defeated that their egg produc­tion drops and finally then they are slaughtered. 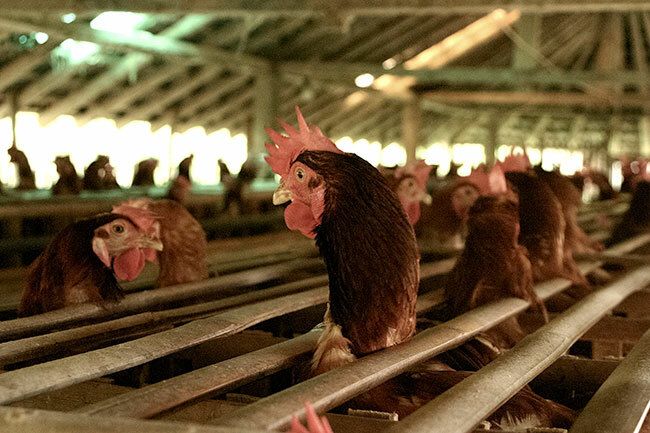 These photos were taken inside of a small-scale egg farm. 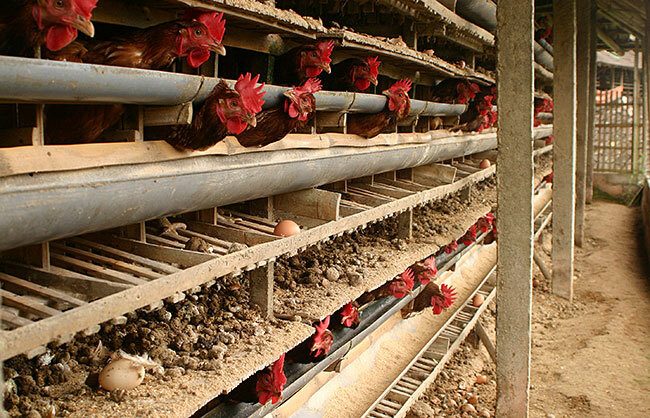 These hens are typical examples of the billions that live under the same condi­tions around the world every single day to produce eggs for our consump­tion. 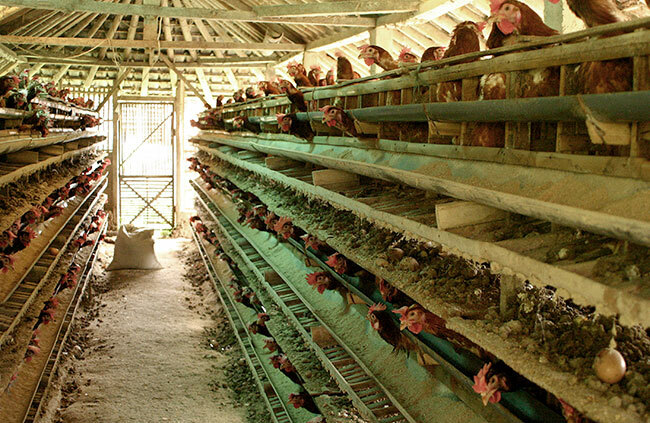 They spend every minute of their lives within these small spaces, never able to feel the ground beneath their feet nor spread their wings. 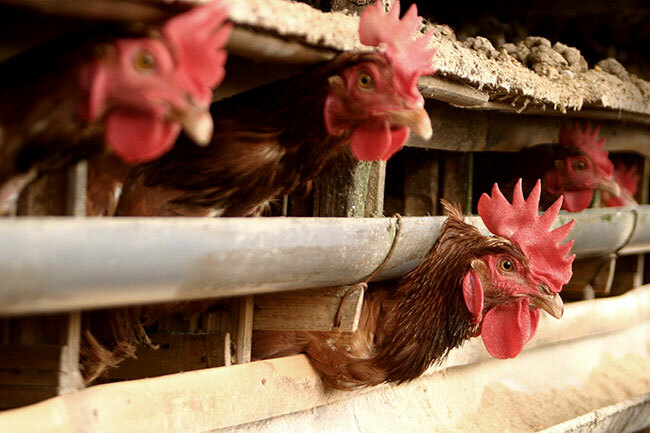 Although the living condi­tions of these hens is one full of only abuse and distress these hens may actually live in better condi­tions than many. 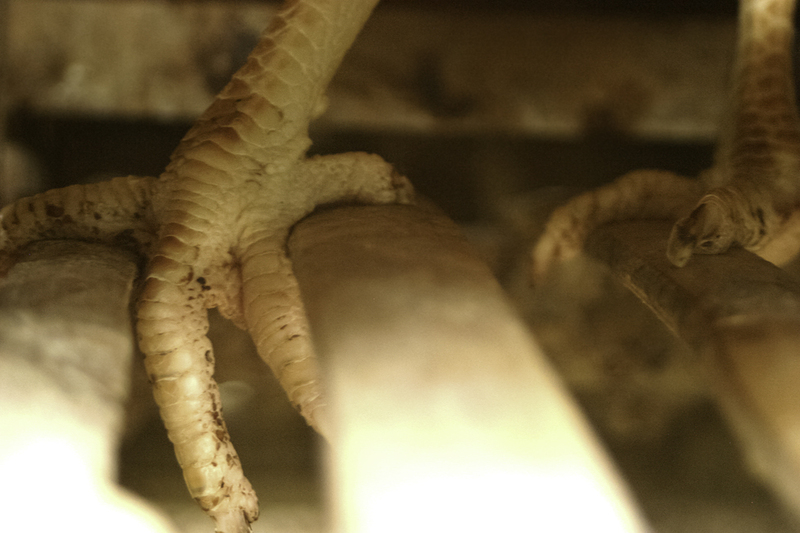 They have access to sunlight and have not have their beaks trimmed which is standard in chicken farming practices. I still love to get together with good friends over a chatty Sunday brunch. A few things have changed however. The nights before don’t seem to go as late as they once did. I guess those are the sad facts of getting older. Also, the food on my plate no longer contributes to cruelty. I admit that it can be a hassel sometimes to find a dish without eggs, especially at brunch. I regularly find myself wishing that more chefs would use more creative alter­na­tives. Luckily there is a shift happen­ing all around us. More and more people are resolv­ing to live in a more compas­sion­ate way and stand up against the injus­tices that others are forced to endure. 2012 is the year to follow through with our resolu­tions. Let’s follow our dreams, be kind to our neigh­bors, be gentle on the planet and let’s live as compas­sion­ately as we can. Yet another inspir­ing post Julie! Yes, the world is chang­ing, and I feel for the better. I was at Caju last night for a birth­day celebra­tion. I asked if one of the dishes could be prepared without fish because I am vegan. Chef Mario prepared such a delicious meal for me that I thought I was in heaven! The woman sitting beside me said she “felt a shift” as she listened to me speak of why I choose vegan­ism. It was a wonder­ful night.